Date of visit May 18th. 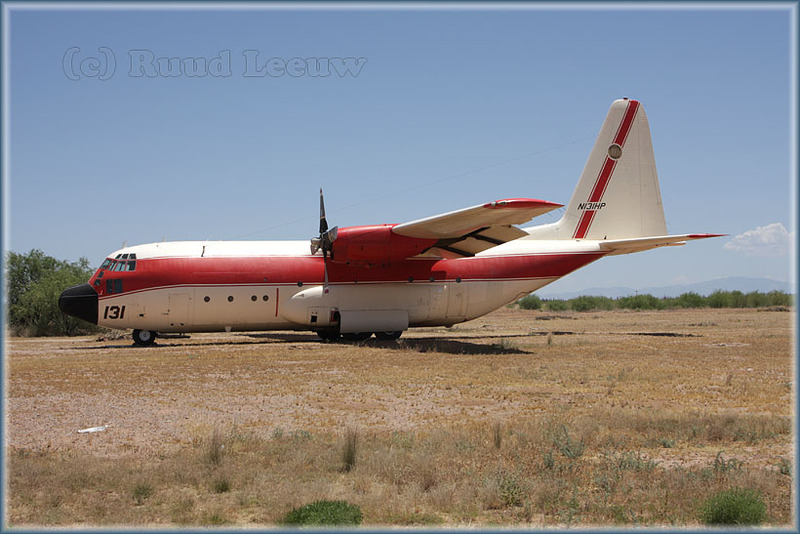 Herc N138FF seems to indicate the vast emptiness of the Arizona desert. 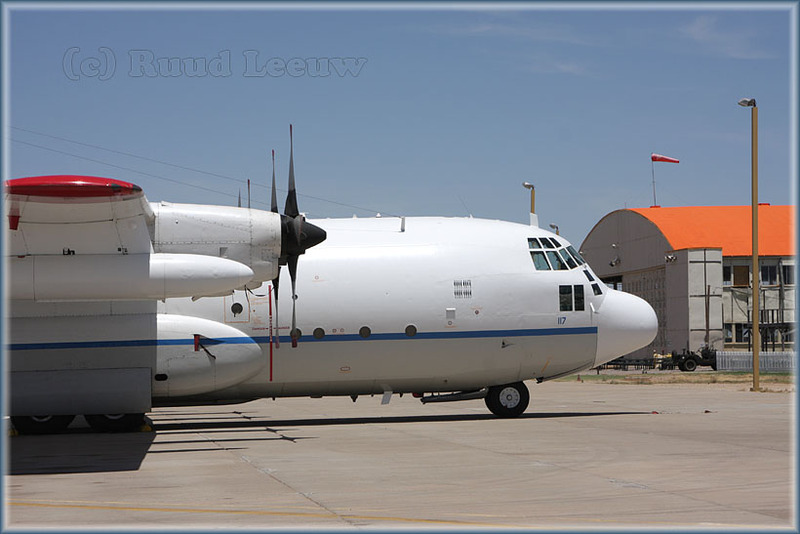 Lockheed C-130B Hercules, N117TG c/n 3018. 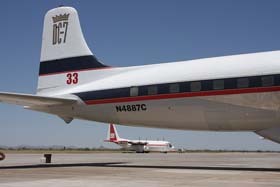 IAR moved to Coolidge,AZ with DC8Fs, out of airtanker industry. 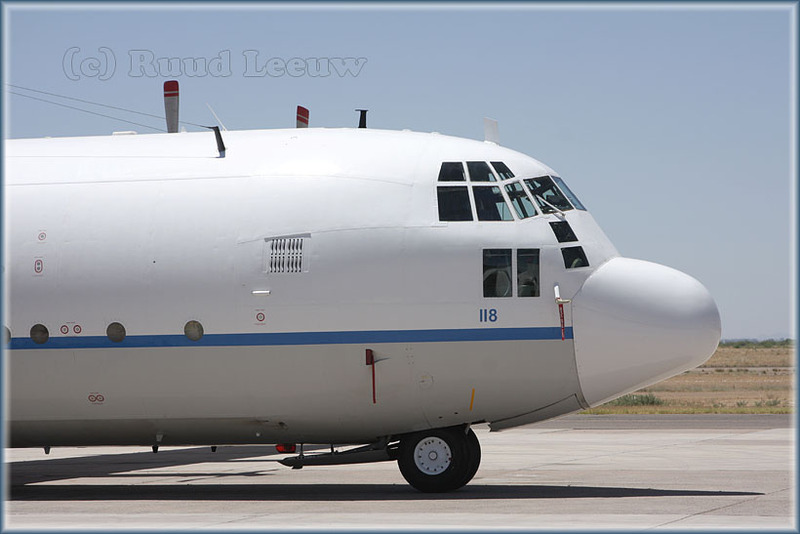 And indeed, this Herc looks operational but has no airtanker identification number. It used to carry '31'. The day of my visit was a sunday and the offices were abandoned, no one around whom I could ask any questions. USAF units: Jul57 61TCS - 1962 18TCS - Aug64 314TCW - May67 4442 CCTW - Nov69 433 TAW ER. To S.Vietnam AF Nov71 and returned to USAF - 327TAS Jan76, Jul76 - Oct77 143 TAS - Dec79, 1981 105 TAS - Apr81, Jan88, last C-130 modified from 'Roman nose', Jun89. C-130A N117TG is former USAF 54-1631 (c/n 3018). International Air Response was previously named T & G Aviation. 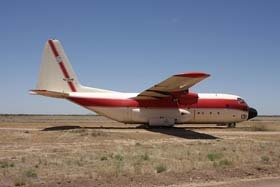 The company started aerial firefighting operations using 2 leased Douglas DC-7B's. 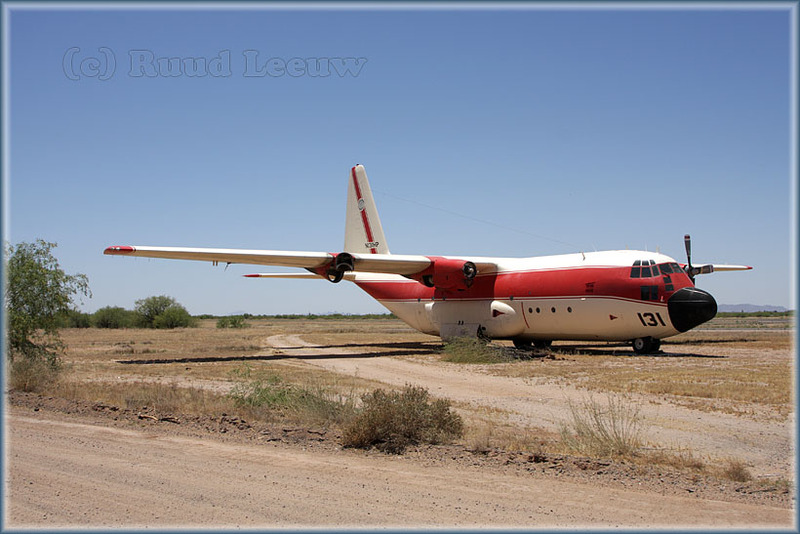 These 'borate bombers' were leased from Arizona-based Airtankers Inc. in 1975. N51701 and N4887C were contracted by the US Forest Service and became based at Wenatchee,WA. T & G stood for the names of the 2 founders: Sergio Tomassoni and William 'Woody' Grantham. Initially, the company was formed at Buckeye,AZ. 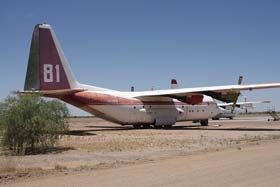 A few years after T&G's formation, a 50 percent share in Airtankers Inc. was bought and in 1979 followed a complete takeover. 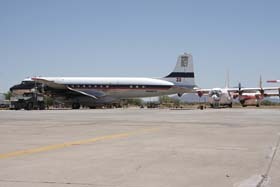 During 1978 T&G had moved to Chandler Memorial Airport, on the Gila River indian Reservation. 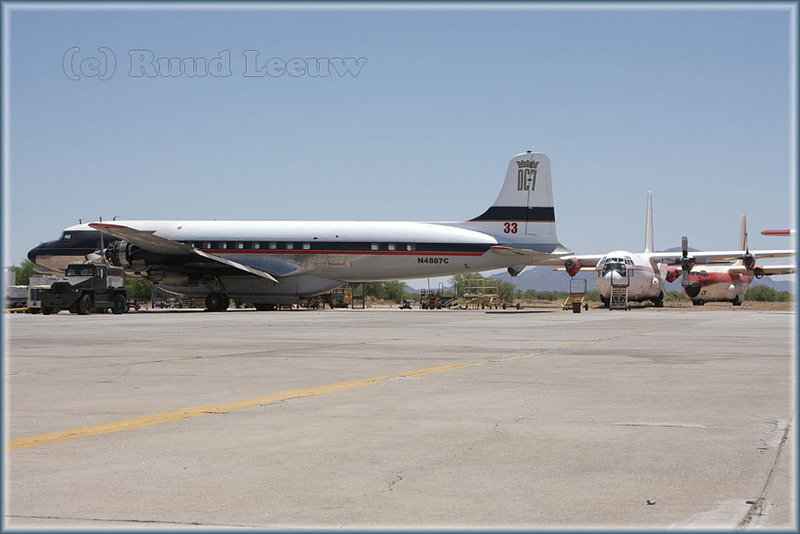 For a long time the Douglas DC-7 was its main type of aircraft and it is great to see N4887C still present here in obvious splendid condition. Bob Wofforth, former Air America pilot, was chief pilot in the early days and also flew N4887C. Around the early-1980s T&G received a permit to operate adhoc cargo contracts, which included the fish-hauling contracts in Alaska. The above details were learned from a 1981 copy of Propliner magazine (Vol.11), article written by Stephen Piercey. 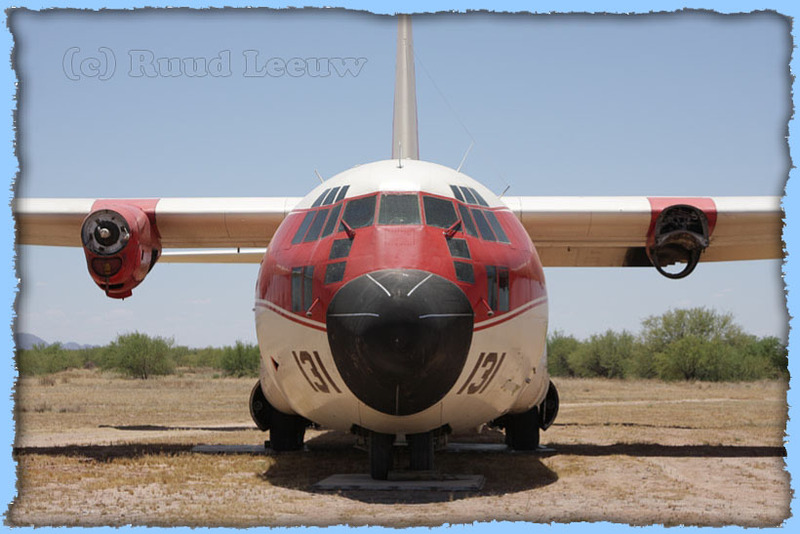 Aad van der Voet added: "T&G was formed in 1973, and operated out of Chandler-Memorial Airport. 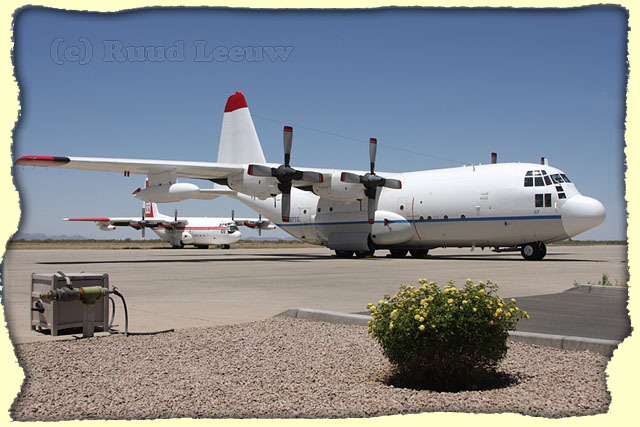 In 1997 they were reorganised as International Air Response Inc. and moved to Coolidge,AZ a short time later. 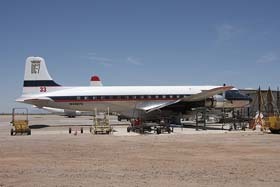 No connection to Gene Packard's former Air Response at Mesa's Falcon Field." These days, I was told, IAR manages to keep itself in business by "..mostly military suppport ops, para training and even some missile testing." 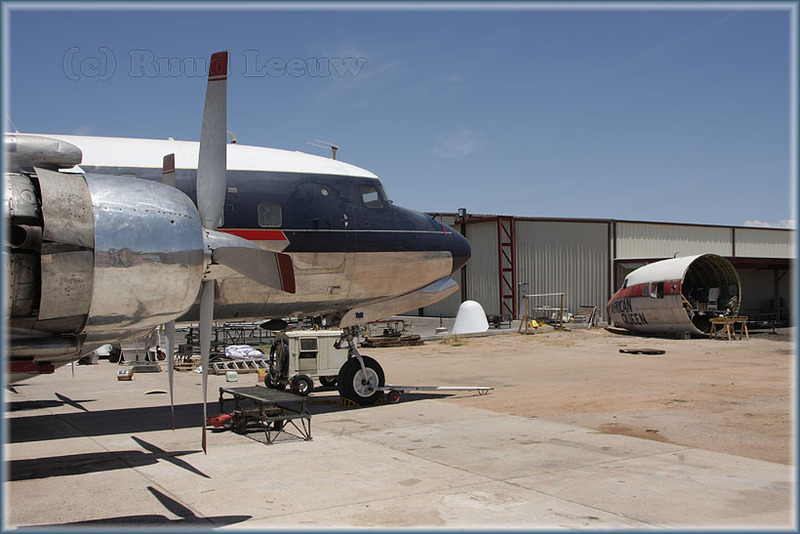 UPDATE DEC.2014: " IAR has essentially moved their operation to Phoenix-Mesa Gateway Airport in Mesa. They still have a facility at Coolidge, but the active aircraft are based at Gateway. 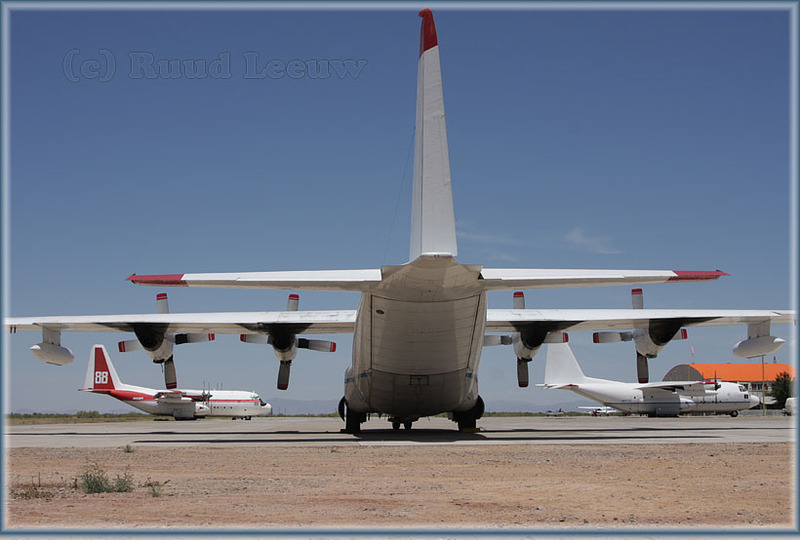 Still at Coolidge are three C-130 hulks and the DC-7. The C-130s still present are 56-530, 56-534, and 57-482. 57-520, which was previously at Coolidge, was restored to flight status in 2012 as N119TG. And: "As well as the 3 Herk hulks, there is (or at least was in October) the cockpit of a 4th one. This appears to me to be from 58-0729 (nose previously reported at Williams/Gateway)." The Coolidge Municipal Airport was originally constructed in the early 1940’s by the U.S. Dept of the Army. 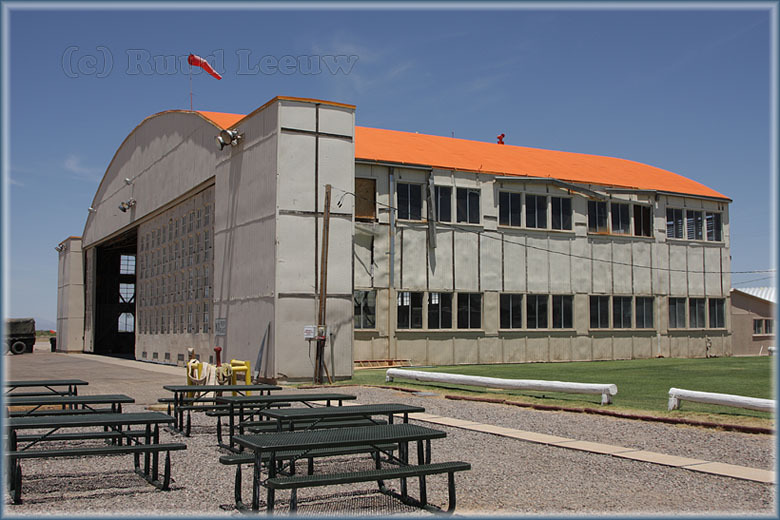 Originally constructed as an air transport command base, Coolidge Army Airfield served as an auxiliary operating base for Williams Field during WWII. The original airfield was constructed with 3 runways in a triangular configuration. Of these 3 runways, two remain: Runway 17-35 and Runway 5-23. Numerous support facilities were constructed, of which a 120-foot by 80-foot hangar still remains. 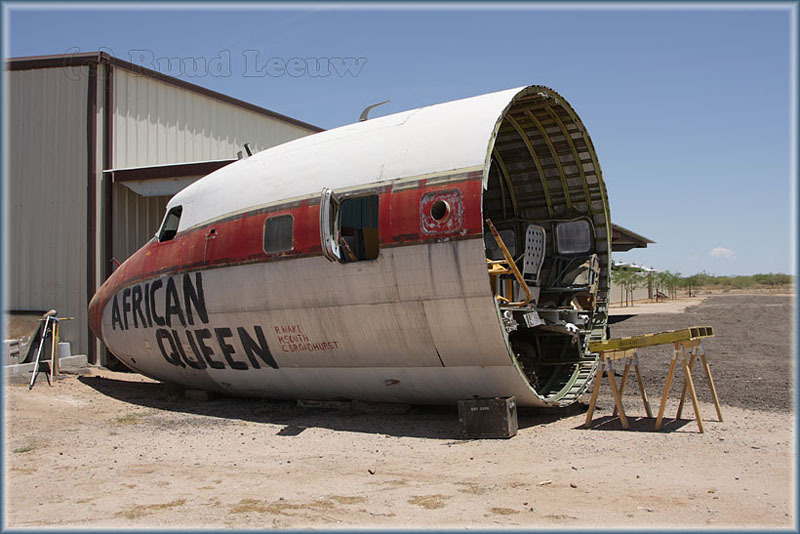 On 19Jan1950 the airfield was transferred to Pinal County since the airfield was no longer needed by the U.S. Dept of the Army. 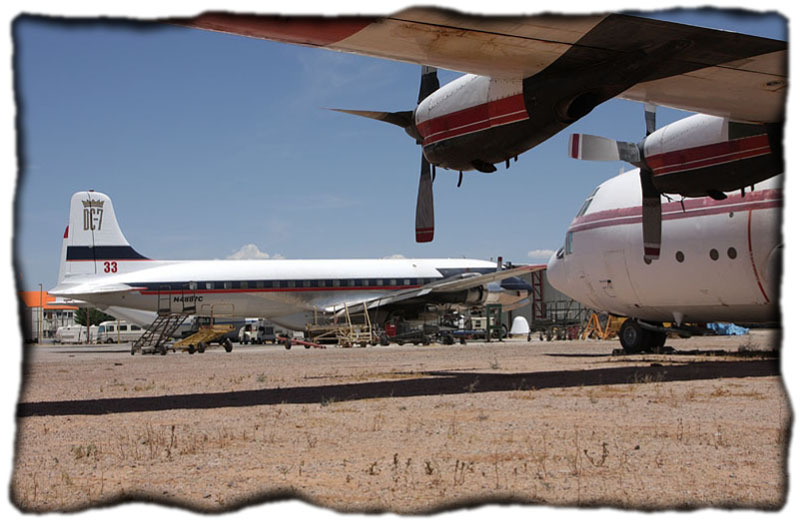 Pinal County owned and operated the airport until 1959 when the City of Coolidge obtained ownership of the airport. 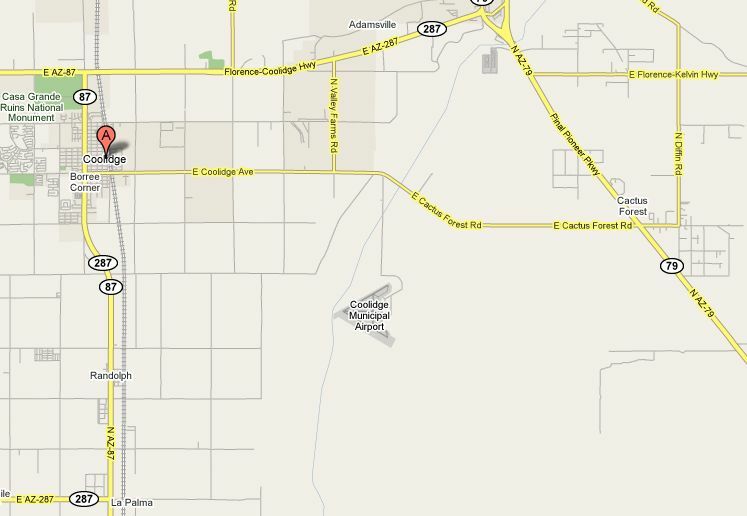 On 02Mar59 the airport was officially transferred from Pinal County ownership to the City of Coolidge. Lockheed C-130A N138FF (c/n 3227) was supposed to be reregistered to N119TG on 05Nov07, but this hasn't been applied. So this aircraft has no operational status for the company, I suppose. N138FF was reregistered as N119TG 11May2007 (manufactured 1957). 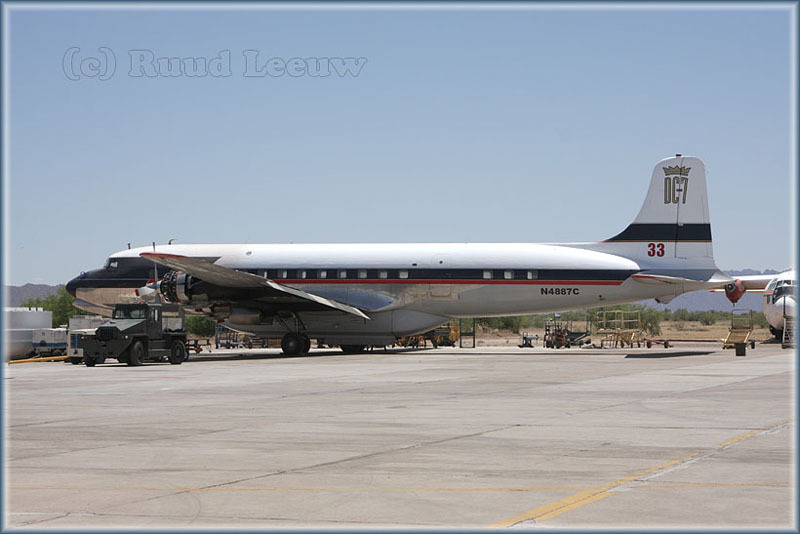 DC-7B (N4887C/Tanker 33) looking absolutely splendid in its partial Delta colourscheme.. Looking ready to go for another season, but did it get any contracts? It sure was hot enough to be on fire alert, but during my visit the main fire fighting activity was in Northern California. 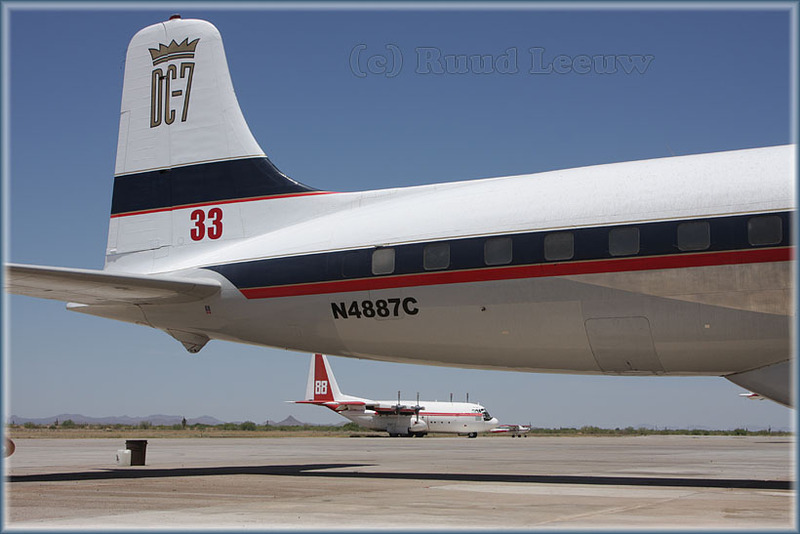 UPDATE DEC.2014: "They made two attempts to fly the DC-7 to Gateway, back in May of this year. The first time they had a fire in number three engine. The second time they aborted a takeoff attempt during which they locked up the brakes and skidded almost to the end of the runway. The brakes were destroyed, as were several tires. 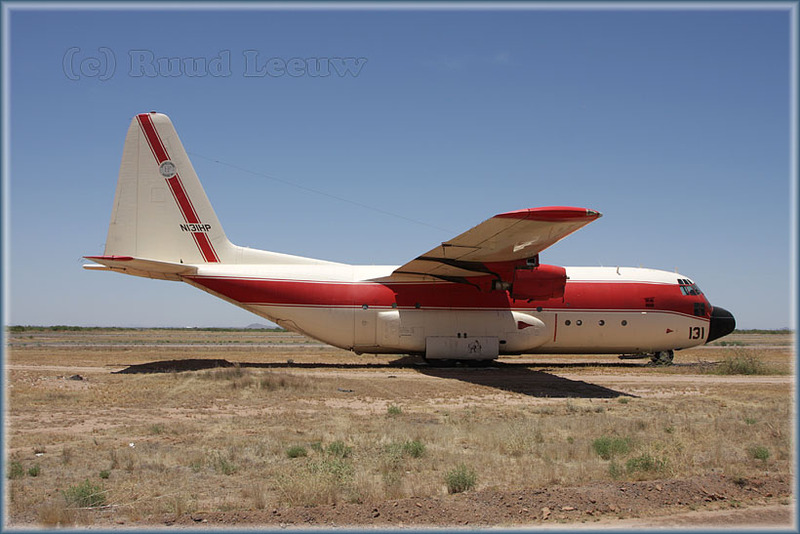 'Two T&G Aviation DC-7 planes were to be flown from Senegal to Morocco for a locust control mission there. Both aircraft were following their flight plan on airway Red 975 at an altitude of 11.000 feet and were flying 1.5 miles apart. Both aircraft were attacked and hit by SAM-7 surface-to-air missiles fired by the Polisario. The lead aircraft (N284) lost one of its engines and part of a wing and crashed. The second aircraft (N90804) lost an engine and suffered other damage, but it was able to land at Sidi Ifni, on the Moroccan coast. Someone wrote me, on the above subject: "Sergio Thomasoni and Woody Grantham (the owners of T&G) were the pilots on this one (flight home, to the USA -Webmaster). Both told me the story many years ago and it was somewhat more interesting than reading it on ASN.."
The famous 'African Queen' has been broken up and was transported from Chandler,AZ to Coolidge at some point. This is DC-7C 'Seven Seas' once operated as G-AOIF by British BOAC. 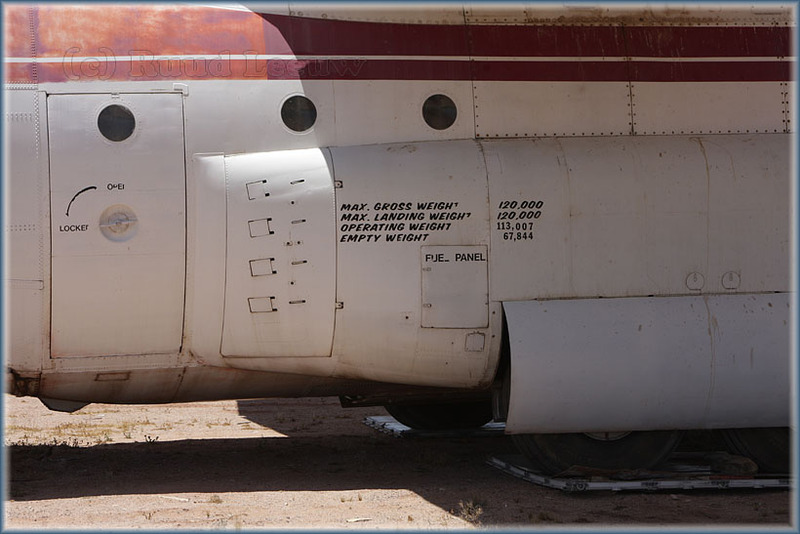 Visit my 2017 report, which includes a revisit to Coolidge Airport. 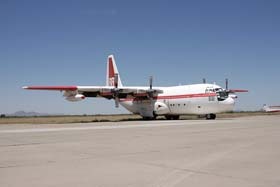 This scandal involved a scheme, called the Historical Aircraft Exchange Program, in which the agency would acquire retired U.S. Air Force C-130A transport aircraft and U.S. Navy P-3 anti-submarine patrol aircraft, ostensibly for use as firefighting airtankers, but which ended up with the planes' ownership being transferred illegally to private companies and the aircraft themselves being used for other purposes or even sold for a profit. The controversy resulted in two of the involved principals being sentenced to prison and a number of civil lawsuits. "Jack Chisum was a vice president of T&G AVIATION (later renamed International Air Response -webmaster) of Chandler, Arizona. He is believed by an investigator to have been set up and turned in to authorities by Evergreen Aviation and Southern Air Transport for "muscling in on the [Middle East] C-130 action." "..Chisum, who was struck and killed by a vehicle while walking down an Arizona highway. Gary Eitel has never been satisfied with the results of the accident investigation, and believes that Chisum may have been targeted, hit and silenced." That	particular article also mentions Hawkins & Powers and Hemet Valley Flying Service. Former Hawkins & Powers air tanker (née borate bomber, née slurry bomber..) N131HP found a new home after former Greybull,WY operator H&P went bankrupt. 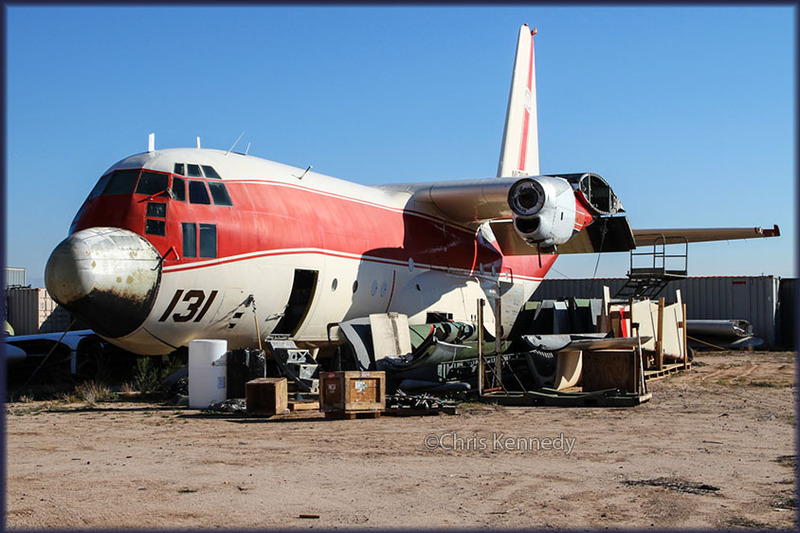 This C-130A has c/n 3142 and was former USAF 56-0534. 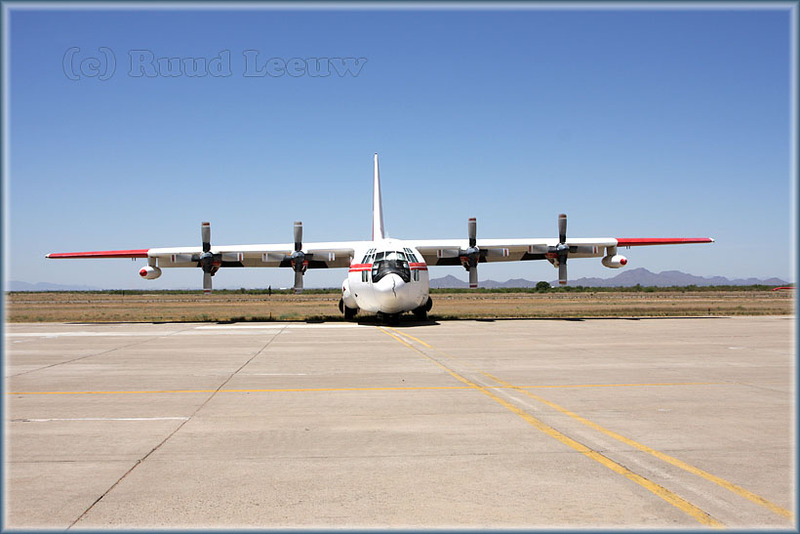 On 28Dec09 a new registration was reserved for this Herc: N126TG. There may be a future for this bird..? 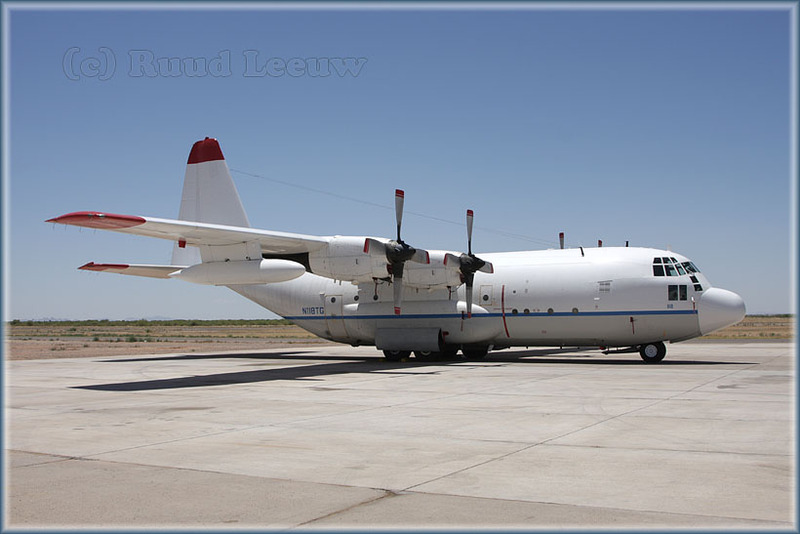 See further down the page the update on this Herc, hard to imagine a future in it. 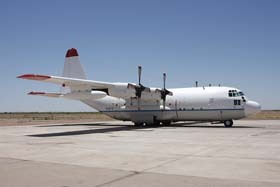 The website of Int'Air Response, www.internationalairresponse.com quotes the use of 6 Lockheed C-130 Hercules aircraft. Here present were N138FF (supposedly reregistered as N119TG), N131HP, N131FF (supposedly reregistered as N125TG), N117TG, N118TG & N121TG. So all accounted for. JP Airline Fleets 2007 only lists N117TG and N118TG. 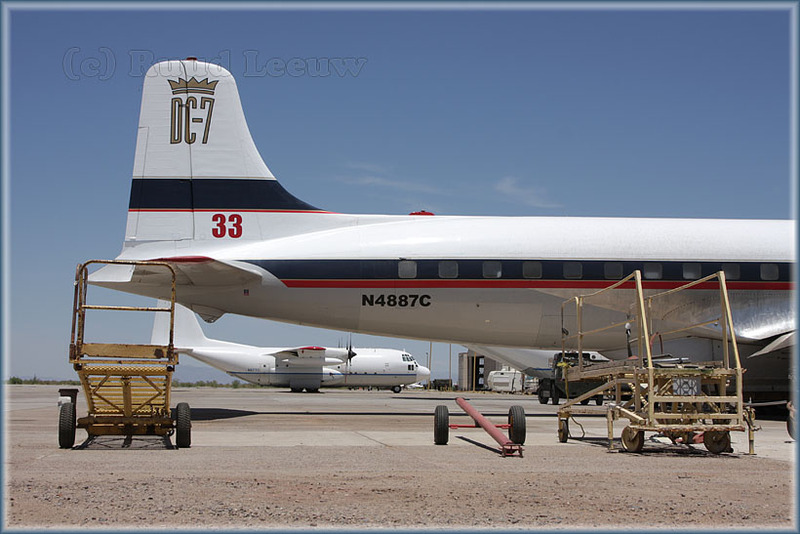 JP Airline Fleets 2007 also lists, besides DC-7B N4887C, 2 Douglas DC-8 aircraft: N995CF & N797AL, both for sale or for lease,ex/ Emery aircraft. The above website states: "At International Air Response we operate three of these aircraft, two DC-8-63s and one DC-8-62." Probably not based here at Coolidge. 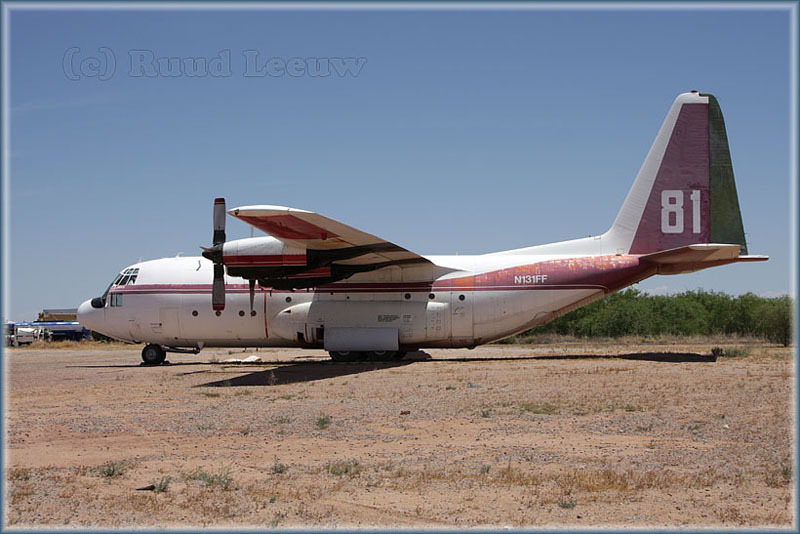 From the above, and the lack of airtanker numbers on N117TG and N118TG, I would say only DC-7B N4887C is used for aerial firefighting..? 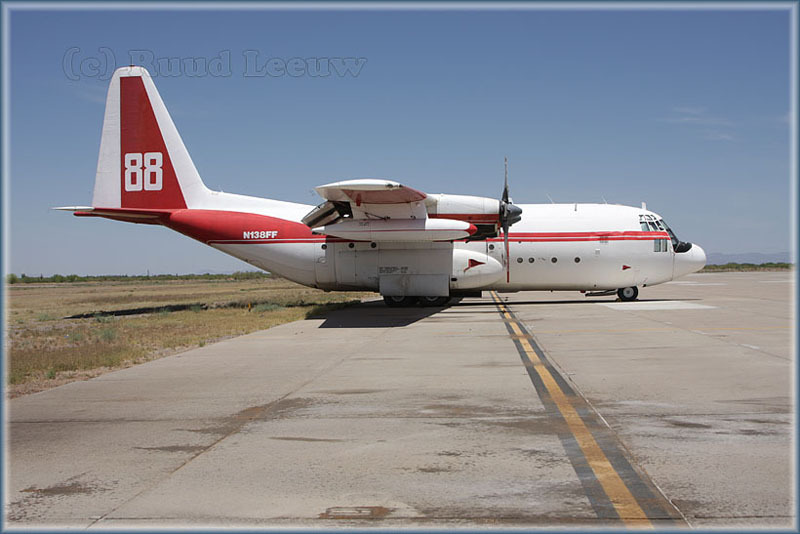 C-130A N131FF (c/n 3138, ex/ 56-0530 USAF) carried airtanker identification '81' also for Aero Firefighting of which I don't know much, except it was listed as having its headquarters at Anaheim,CA though Tanker 81 seems to have lived mostly at Chandler,AZ. 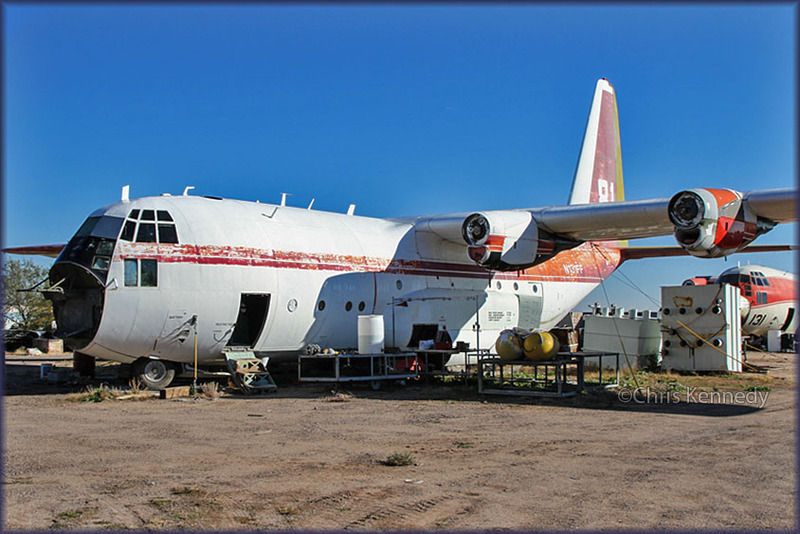 "I was delighted to see the Hemet-Valley Flying Service C-130s I grew up around as a kid on your website. 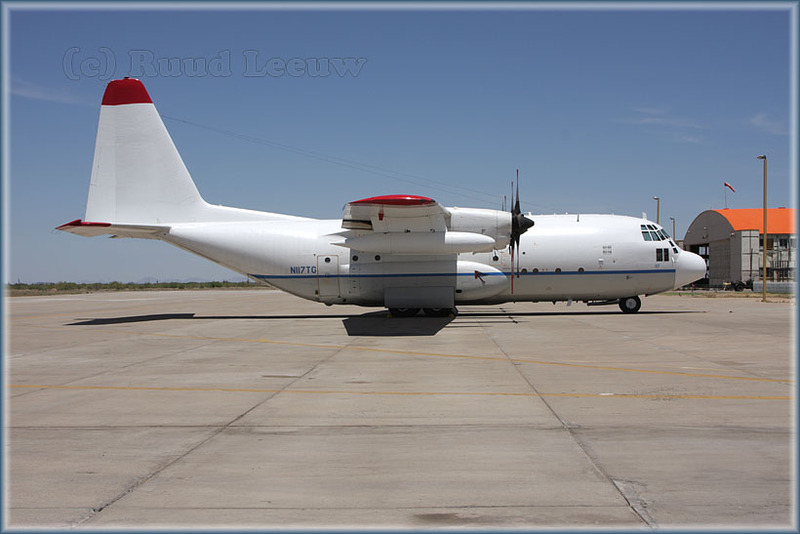 They, Hemet-Valley Flying Service, obtained five C-130A aircraft from the US Government to use as air tankers in 1988; they were quickly converted and began use, with two flying in 1989. All were based at Hemet with N138FF and N131FF among them. They were Tanker 81, 82, 83 and 88. Of those four, all were painted with the exeption of 83, which was quickly prepped for use and was never completely painted to match the others. Instead, Tanker 83 flew in its original olive drab USAF colours with a large orange stripe on the tail that had 83 in the center, and '83' painted just below and behind the cockpit. 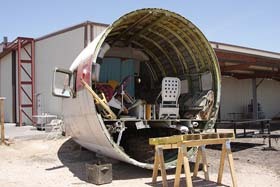 A fifth was cannibalized for parts and was only recently removed from Hemet-Ryan in 2008 after sitting there for over a decade. I think a lot of the registration confusion on some of the aircraft were that they were re-registered to a leasing company after they were obtained... probably the Anaheim hit you got. The strange thing is registration was handed off several times as far as I can tell, but they always remained in the hands of Hemet-Valley Flying Service." The Lockheed C-130 Hercules is an American four-engine turboprop military transport aircraft built by Lockheed. 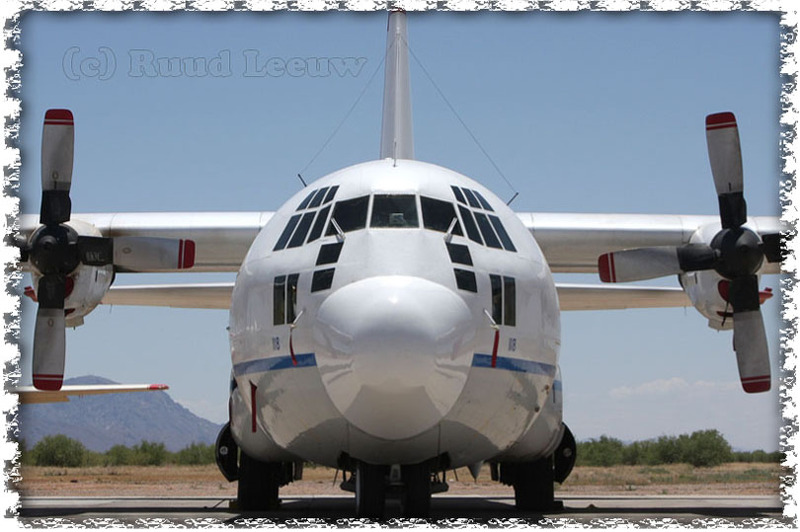 It is the main tactical airlifter for many military forces worldwide. 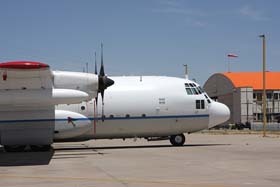 Over 40 models and variants of the Hercules serve with more than 50 nations. In December 2006 the C-130 became the fifth aircraft—after the English Electric Canberra, B-52 Stratofortress, Tupolev Tu-95, and KC-135 Stratotanker—to mark 50 years of continuous use with its original primary customer, in this case the United States Air Force. 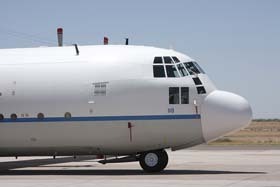 The C-130 remains in production as the updated C-130J Super Hercules. Capable of takeoffs and landings from unprepared runways, the C-130 was originally designed as a troop, medical evacuation, and cargo transport aircraft. The versatile airframe has found uses in a variety of other roles, including as a gunship, for airborne assault, search and rescue, scientific research support, weather reconnaissance, aerial refuelling and aerial firefighting. The Hercules family has the longest continuous production run of any military aircraft in history. During more than 50 years of service the family has participated in military, civilian and humanitarian aid operations. 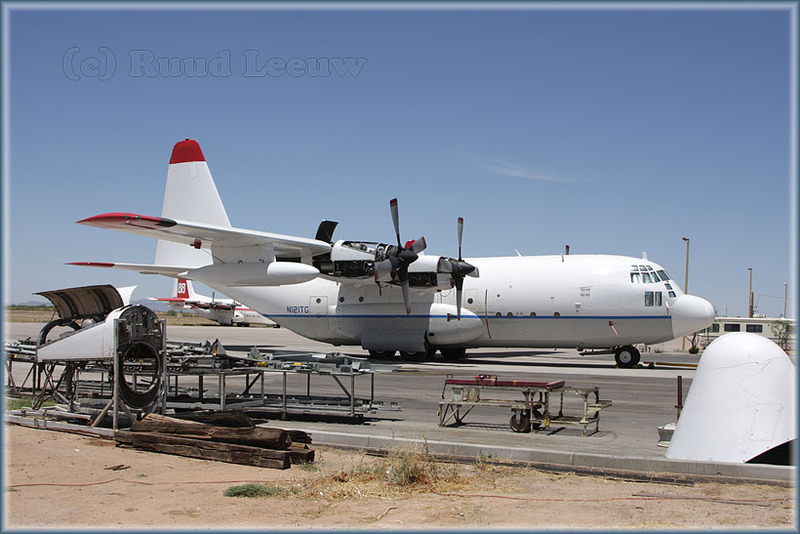 N121TG is Lockheed C-130A Hercules c/n 3119, former USAF 56-0511 and former airtanker 83. Recommended reading for individual histories on Lockheed Hercules aircraft are the reference guides written by Lars Olausson. 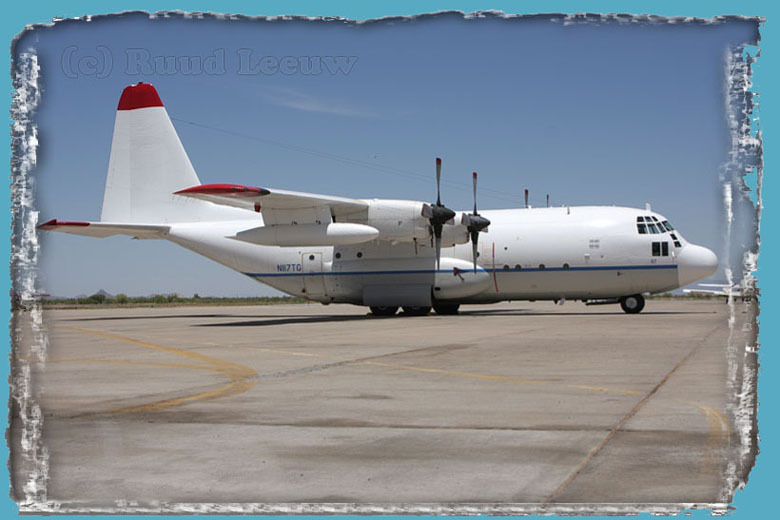 Lars Olausson is a retired officer of the Swedish Air Force, who has published an annual volume on the history of the Lockheed C-130 Hercules airlifter, titled the 'Lockheed Hercules Production List'. Issue 1954-2009, the 26 edition, has been printed April 2008! 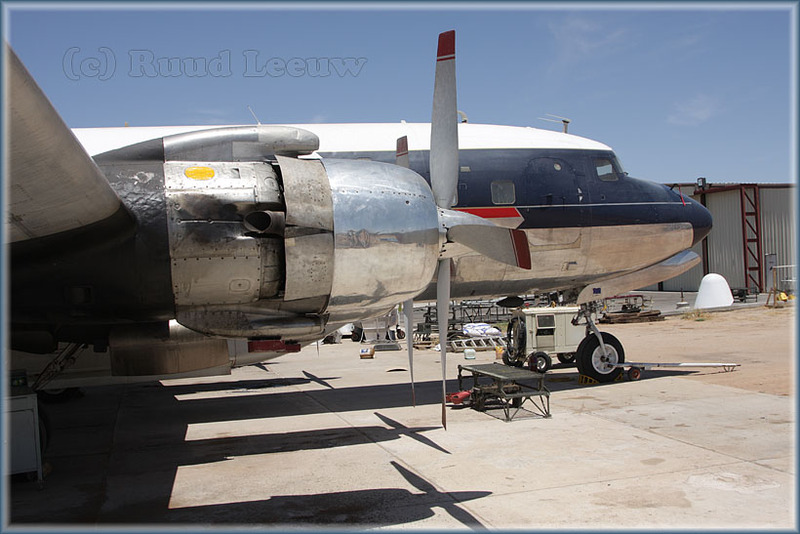 "I went to Coolidge,AZ last weekend and found people working on the DC-7: the no 1 and 2 engines had been run for the first time in several years the week before and now plugs were being changed and other maintenance done; engines 3 and 4 were due to be run shortly. 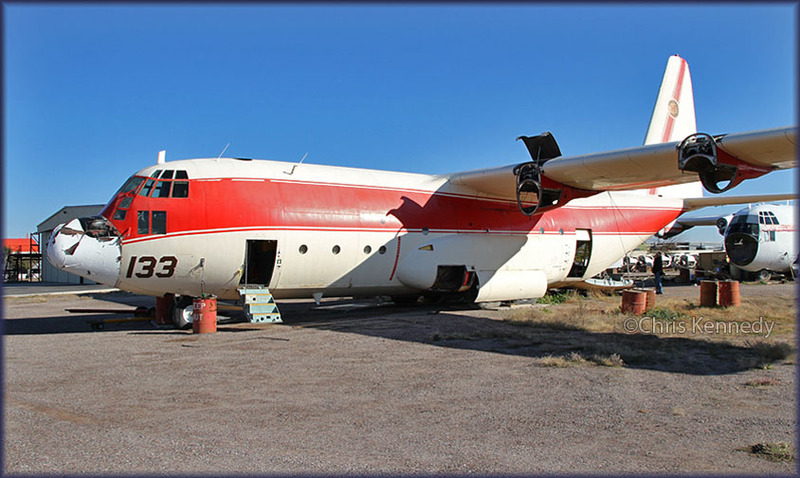 Apparently the plan is to fly the aircraft to Mesa-Williams Gateway, where International Air Response have a hangar and there further restoration work will be done. It is not in airtanker configuration any more, the tanks have been removed, but maybe they are easy to re-install. 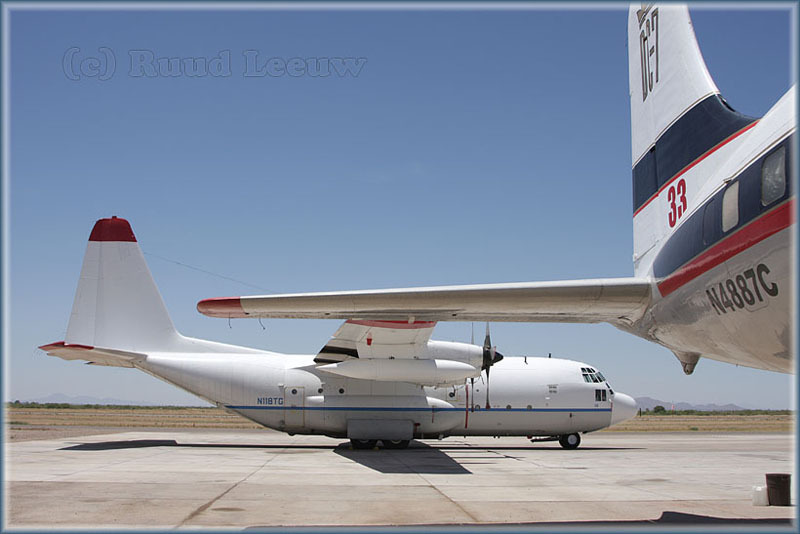 "IAR has essentially moved their operation to Phoenix-Mesa Gateway Airport in Mesa. They still have the facility at Coolidge but the active aircraft are based at Gateway. The C-130s still there are 56-530, 56-534, and 57-482. 57-482 still carries an active registration as N133HP. 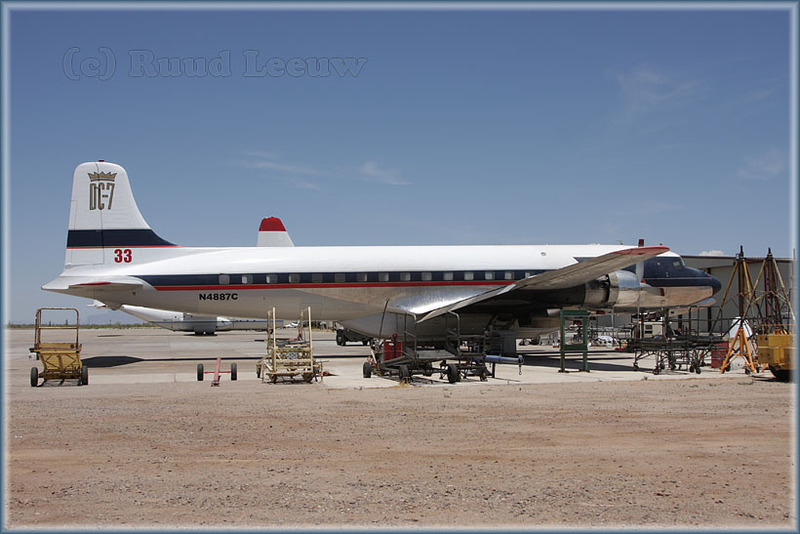 57-520, which was previously at Coolidge, was restored to flight status in 2012, as N119TG. " 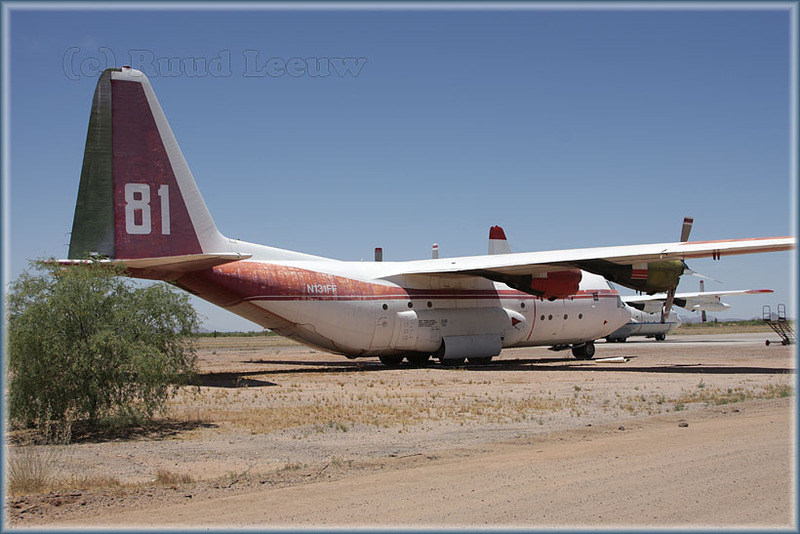 Tanker 81, C-130 N131FF (ex/ 56-530) reg'd N125TG (reserved 19Mar14). '81' is its former US Forest tanker code. 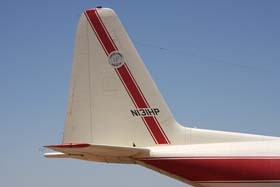 Tanker 131, N131HP (ex/ 56-534), registration reserved for IAR 30Sep11 with renewal scheduled 11Sep14. But N126TG was also reserved (23May2014, Certificate reg'd 15Feb08). Academic probably. 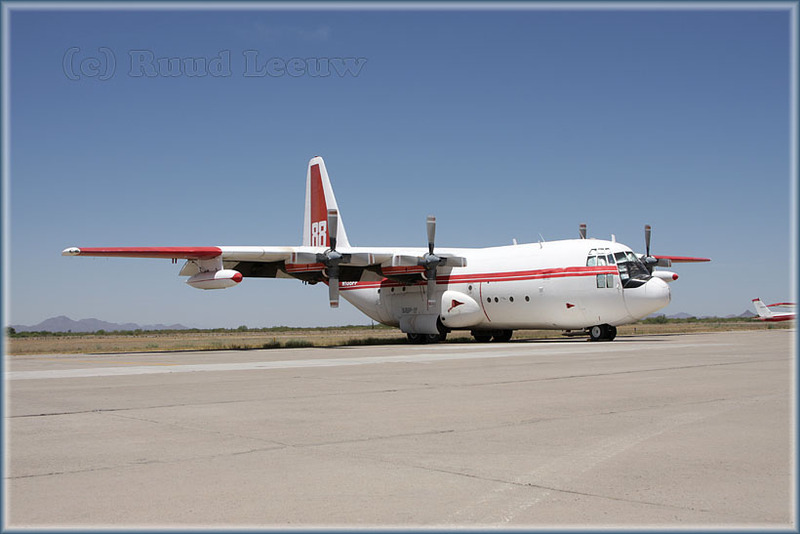 Tanker 133, C-130 N133HP (ex/ 56-482), registered 07Mar07 for IAR. Mike Bursell sent me this image (Dec.2014) as an update. This cockpit of an unidentified Lockheed C-130 Hercules is a recent addition here at Coolidge. Mike wrote: "Taken 28Sept2014. I’m 99% certain that this is 58-0729. 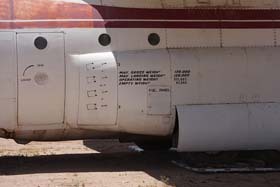 Reasons are, firstly that it has clearly been stored in AMARC (58-0729 was there 19Mar01-12Jul00), second – you can read off the digits '07..' through the paint. 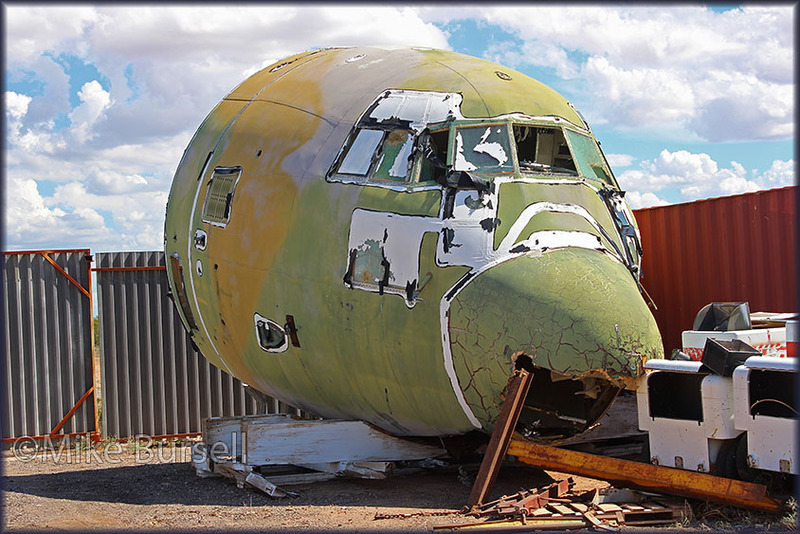 And, finally, because the nose of 58-0729 has been seen previously at nearby Williams/Mesa-Gateway. Other candidates do not match these criteria." It was still in place in march 2017, little or no change to it.